We have been getting multiple reports that some taxpayer tax refunds never hit their cards or banks. If you never received your tax refund after seeing a scheduled direct deposit date message here are a couple of things to remember. Here are a few steps you can take if you never received your tax refund on your scheduled day. What if I paid nothing out of pocket to file my tax return? “Refund Transfer” is an option offered by certain tax preperation companies. You can pay your tax return filing fee by deducting it from your federal tax refund. It’s a convenient way for some taxpayers to pay filing fees. Most tax preperation companies offer Refund Transfer service, you can pay your tax preparation and related fees and other authorized amounts with your refund. Your fees are deducted directly from your tax refund after all services are complete. If you filed your taxes through a local tax office they may have your check at there office. Each year there are billions of dollars of refund checks that are undelivered due to incorrect mailing addresses or wrong bank account numbers. How do I claim my missing refund check? 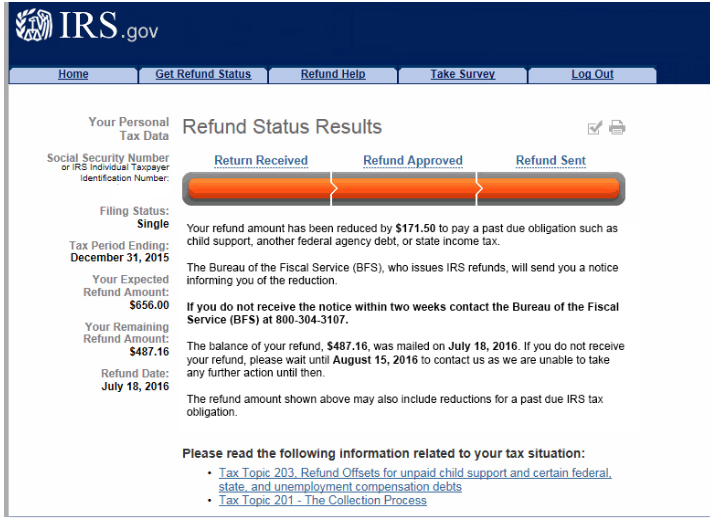 If your refund check was returned to the IRS, you might be able to change your address online via the IRS website. Call 1-800-829-1040 to verify your mailing address or your bank account. If you can’t update your mailing address online, download and mail Form 8822 to the address listed on the tax form. Next time, e-file your taxes and sign up for direct deposit. It is more accurate, and you get your refund faster! Which office is originating IRS tax refund payments? I requested a direct deposit refund. Why are you mailing it to me as a paper check? IRS can only deposit refunds electronically into accounts in your own name, your spouse’s name or in a joint account. If the taxpayer entered the wrong account information, the financial institution may reject a direct deposit. IRS can’t deposit more than three electronic refunds into a single financial account or pre-paid debit card. The IRS assumes no responsibility for any tax preparer or taxpayer error. Please verify your account and routing numbers with your financial institution and double & triple check the accuracy of the numbers you entered on your return prior to signing and submitting it. You should not request a deposit of your refund into an account that’s not in your own name. You omit a digit in the account or routing number of an account and the number doesn’t pass the IRS’s validation check. In this case, the IRS will send you a paper check for the entire refund instead of a direct deposit. You requested a Refund Anticipation Loan (RAL) or Refund Anticipation Check (RAC) through your preparer or preparation software. Usually this occurs when you authorize the fee for preparation to be taken from your refund. Even if you didn’t request a direct deposit, these types of refunds are directly deposited into the preparer’s financial institution so you should contact that institution for resolution. See the last solution bullet below. 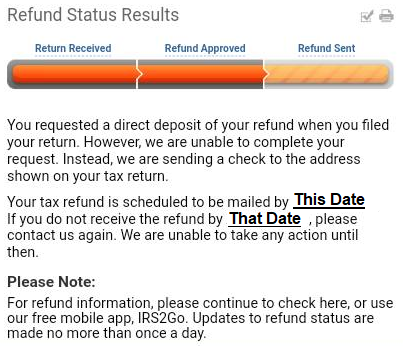 If the return hasn’t already posted to the IRS computer system, you can ask them to stop the direct deposit. You may call the IRS toll-free at 800-829-1040, M – F, 7 a.m. – 7 p.m. If funds aren’t available or the bank refuses to return the funds, the IRS cannot compel the bank to do so. The case may then become a civil matter between you and the financial institution and/or the owner of the account into which the funds were deposited. What if you moved or changed bank accounts since you filed your tax return and the IRS does not have your new mailing address or new bank account number? Next time, efile your taxes and sign up for direct deposit. It is more accurate, and you get your refund faster! If the numbers you indicated on your tax return are correct, then call the IRS at 800-829-1040 speak to an agent and ask them to initiate a refund trace to recover your refund. If the numbers you indicated on your tax return are incorrect, then you’ll need to deal directly with the bank in which your refund was deposited. You’ll know which bank and bank account it is since you have the bank routing numbers listed on your tax return. If you don’t know the bank the routing number belongs to Click here to search routing numbers. In the future, always get a check, unless you are 100% sure that your bank information is correct. These procedures outlined here may help some people retrieve a tax refund that was incorrectly deposited into the wrong account within your financial institution. If the procedures above do not work for your situation the taxpayers may want to consult with an attorney to review options for taking legal action to recover a refund that was directly deposited into the wrong account. a public benefit overpayment (such as HUD, VA, or Social Security). To find out if you may have an offset or if you have questions about an offset, contact the agency to which you owe the debt. IRS may also have changed your refund amount because they made changes to your tax return. You’ll get a notice explaining the changes. Where’s My Refund? will reflect the reasons for the refund offset when it relates to a change in your tax return. Tax Topic 203 – Refund Offsets for Unpaid Child Support, Certain Federal and State Debts, and Unemployment Compensation Debts has more information about refund offsets. What should I do when the refund I receive is not from my tax account? Please don’t cash the refund check or spend the direct deposit refund. Send the refund back to us. Tax Topic 161 – Returning an Erroneous Refund – Paper Check or Direct Deposit has more information on what to do. In these situations, you are supposed to be notified in writing, but sometime you will not receive a letter until a few weeks after the deposit. You can find out more about tax refund Offsets here!